Screws  These round head slotted zinc-platted screws come in 3/8 and ½ inch sizes. Rivets  You can use these as end bearings for wooden baits like globes and toppers. Cotter Pins  You can use these to hooks on wooden lures. Hook Spreaders  you can use these to position hooks further apart for better hooking action. Split Rings  We carry a complete line of stainless steel split rings in fine, standard, heavy and super-ring styles. They come in variety of sizes to meet your split ring needs. 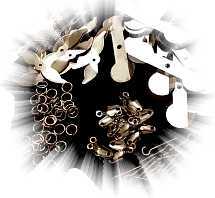 Hook Hangers  These hook hangers are used to attach your hooks to your wooden lures. Disc Washers  These can be used as spacers or to give your lures a finished look. Screw Eyes  We carry a variety of closed and open loop screw eyes to help you refurbish or enhance your lures. Snaps  We carry a full line of snaps to for your quick change needs. Styles include the Duo-Lock, Stay Lok, Coast Lock, Double-Lok and Hooked Snap. Swivels  Regardless of your swivel needs, we have a style on-hand to meet you need. Wire  We carry a very complete inventory of wire sizes and finishes for any lure or leader application.